Iconic are a Korean stationery brand. The Journal Shop stock a range of their products all of which look lovely and by their design styles I would say that they are marketed towards women rather than men. Despite their Korean heritage the brand seems to use French on a lot of their products. This could be to appeal to broader audiences, or simply could be an interest in French culture from the brand. It's inoffensive and works well with the style the brand achieves. The Ashley notebook appealed to me in part due to the fun designs and colour options, but also because, rightly or wrongly, I put a lot of trust in Asian stationary brands for good quality writing instruments and stationary. It's not often I choose a notebook solely based on its look but these really caught my eye and for £2.95 I was hooked. The Journal Shop does a great job of having a lot of photos of the product (albeit stock images from Iconic themselves) but this really helps to see a product being used in different scenarios when trying out something new. In terms of size the Ashley notebooks has 48 pages and is a nice wide A5 notebook. There are four different design options available, each look as lovely as the next. The A5 size is perfect for real note taking or writing allowing you to get a lot onto the page. The paper quality in these notebooks is quite good. I am unable to find out the exact paper weights however with a extra fine or fine fountain pen you can get away with minimal bleed-through. 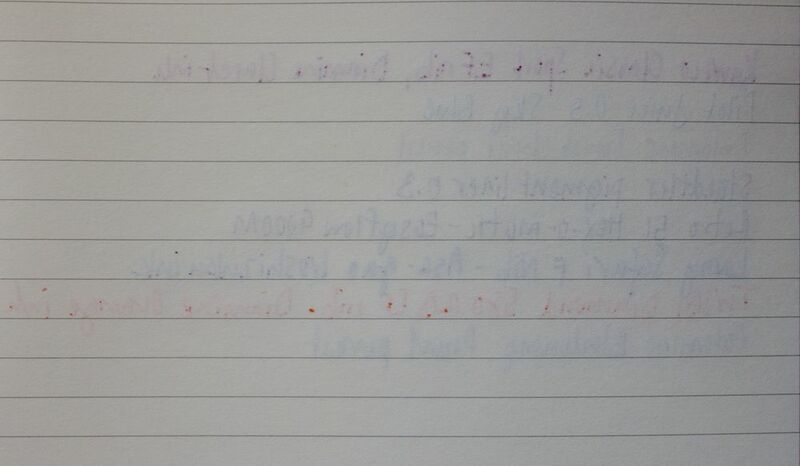 You can get some feathering on the page dependent on the brand of fountain pen used and the ink. I have been using mine on a daily basis with a TWSBI Diamond 580 RB and the Lamy Safari with minimal issues. You can see from the photos below that a range of pens, pencils and fountain pens hold up well with these notebooks. The Ashley notebooks only come in a ruled option, there are no alternative grid systems. This could be a negative for some people, however when using this notebook purely for writing I find it quite nice. The lines blend nicely into the background and are not too bold on the page. Another positive. I really like the Iconic Ashley notebooks. Depending on how these notebooks are used I think they perform well. If you are very particular about fountain pen ink bleed through then these may not be for you. The size of the notebooks are also great for people on the move or for use when travelling. I am not sure if these notebooks will be regular rotation in my ever expanding notebook arsenal, however they are great to try out and even as gifts for friends.